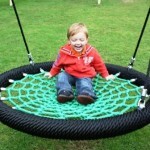 We have been supplying and installing childrens swings since 2003. Baby Seats - Highback Baby Seat, tp Early Fun Baby Seat and Premium Highback Baby Seats in multiple colours. Toddler Seats - Growable Seat, tp Junior Seat, tp Quadpod and Premium Growable Seats in multiple colours. Junior Seats - Flat seats in Small, Standard, Premium, Standing, Wraparound, Wooden and Rubber. Senior Seats - Rope Ladders, Tyre Seats, Buoy Balls, Trapeze Bars and Gym Rings. Multi-User Seats - tp Pirate Boat, tp Skyride, Duo Seats and our own range of Nest Seats. Playground Seats - we also offer a comprehensive range of Commercial Swing Seats, which are certified for use in public areas. Hopefully you will find plenty of information on these product pages, however, if you have any questions please do not hesitate to contact us. Premium Childrens Twizzler, great for upper body strength, available in different colours and with a length adjustable natural hemp ropeset. Hang, swing and spin! 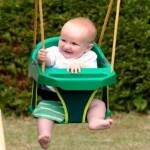 Our Metal Duo Swing Seat allows two children to swing together. 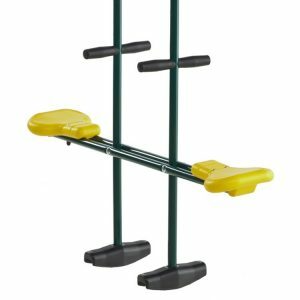 Height adjustable and suitable for 4″ (100mm) round timber.